We’re all just human beings who want to be loved. It’s a little secret that has been helping shape the way I see myself and other people. The politician, the protester, the child acting out, the angry driver, the mom yelling in the school parking lot, the young, the old—all of us. We’re just human beings who want to be loved. It started with an internet troll, of all things. One fateful night I received a nasty comment from a guy on Twitter. I’d grown used to occasional jabs and snarky remarks, but this was lewd, wildly vulgar, and painfully untrue. Consumed by all the incoming transmissions, I’d had it. So I sent the guy a message. I let him know I was a real human being and that I’d read the things he’d said about me. I let him know who I was and what I was trying to do. I let him know it was okay to disagree with me, but it was not okay to spread something hateful and untrue. Just had to let him know. I sent the message and immediately regretted it. But, then he wrote back. It was more than an apology. It was him, like me, communicating that he was a person too. He told me about his problems. He’d been having a rough time in recent years at work and as a dad. He told me about his child’s special needs and all the struggles that went with it. He’d been having a tough month. He opened up. Suddenly we were just two human people. The anger faded and we were left with the reality that we were two very different, but deeply connected people. 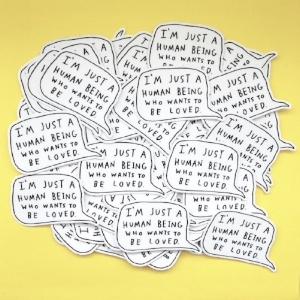 I began looking at every internet comment as someone really simply saying: “I’m just a human being who wants to be loved.” The kind words, the stinging criticism, the flippant dismissal. All of it. I began seeing every post on Instagram as someone saying “I’m just a human being who wants to be loved.” I can no longer hear any words from anyone the same way again. More importantly, I can no longer look at any person the same way again—even myself. GO LOVE EVERY PERSON YOU FIND.